Arriving in Athens airport yesterday afternoon, I had no idea what to expect as I hopped on the Metro and made my way to meet the other IBBY UK delegates. Who was I going to meet at the conference? What talks would I get the opportunity to hear? What really happens at an international conference on children’s books? Once we had arrived and registered, there was just time for a coffee and a few conversations before the opening talks began. 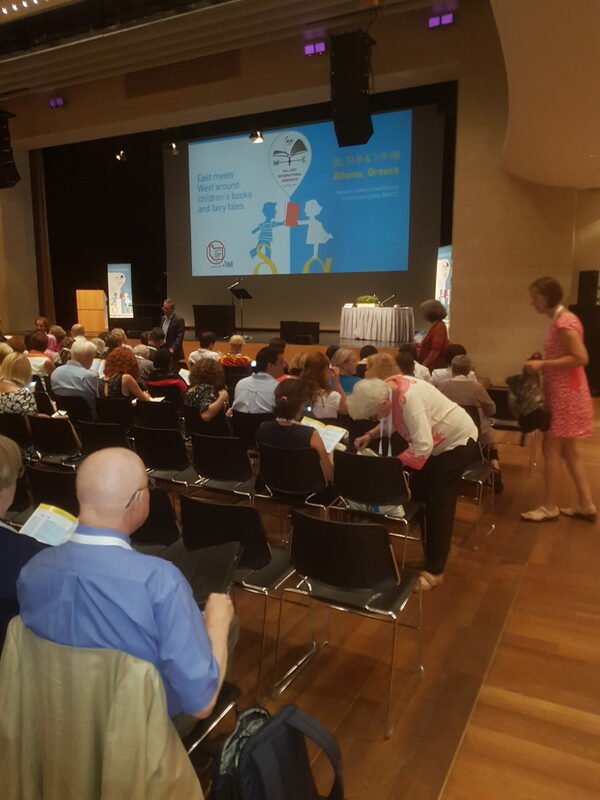 The welcome speech by the 2018 President, Wally De Doncker, immediately set the tone for the day’s events; his passion for promoting inclusivity in children’s literature shone through. As he emphatically reminded the audience at the end of his talk, “children must be treated with respect. Full stop.” Wally’s emphasis on the importance of welcoming refugees and representing diverse experiences provided a good springboard for a day filled with transnational research projects and ideas related to the theme of ‘East Meets West’. The day was so packed with presentations, posters and meeting people that there isn’t space to go into every part of the schedule in detail and, inevitably, no one delegate could attend all the papers and talks that were happening simultaneously: Dr Perry Nodelman’s keynote lecture on post humanism approaches to literature (through a very extensive exploration of fish-based picture books! ); sessions on the representation of refugee experiences in Syrian and Honduran Young Adult literature; the role of translation in celebrating texts written originally in underrepresented are just a few of the talks I attended. I’m going to focus on just one presentation that was particularly inspiring. Thea Shahrokh, an academic based in the UK but working internationally, presented research on a collaborative approach to refugee representation. Her talk, ‘Refugee Children as Authors and Artists of Picture BooksL Exploring Sameness, Difference and Solidarity’, focused on a recent project based on the creation of picture books for children by children. As both a teacher and an academic passionate about diverse representation, I am always keen to find different and recent portrayals of refugee experiences in children’s literature. As Thea stated in her talk, political discourse is inseparable in today’s world from refugee stories. Her project promotes the involvement of children in picture book production, with methodology focused on engaging them with different art forms and digital storytelling to create their own stories. The end product? Books by children with personal refugee experiences for children with personal experiences. Whilst these should not of course replace increased adult-written publications that depict the many different stories that fall under the complex umbrella term of ‘refugee’, this collaborative approach – and the impact it had on providing its participants with recognised identities – was really interesting to hear about in detail. It is one of many action research, collaboration-based projects that was shared on the first day of the IBBY Conference. However, the presentation was so clearly delivered and the quality and variety of the children’s final stories so strong that it served as a reminder of the importance of engaging children not only as readers but as valued writers. As one of the stories that Thea shared said, “I am Ghena. I was born in Syria. When the war started, I was happy because I didn’t know what war was.” I left the talk re-inspired to create connections across cultural backgrounds, both in the classroom and in academia, finding ways to empower voices too long left disempowered.